There is a water fall 2km up stream from Tajiri. It is about 20km high. 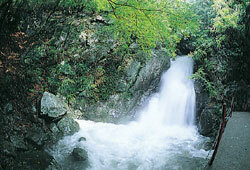 There are some more falls up stream that are introduced in a book called kiikunimeisyozue. There are Kannonzo and a monument of Kano Shohei. This is one of nature in Kii Penninsula,and is gradually made into a hiking course. You can enjoy the sounds of the falls and the enchantment of the forest in Autumn. The Hidaka River flows from the streams of Mt.Gomadan and the surrounding mountains. These join together to make the mighty waters of the Hidaka River. There are many admired and magnificent views along the river side. You can discover remains which convey old times. 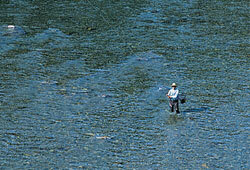 A lot of fisherman visit during the season to catch river trout. When it comes to the best view in the Nakatsu area,it is Heisei no Mori. You can see the fareway mountains from the summit. There are walking paths,playground,and the rest areas in the forest. 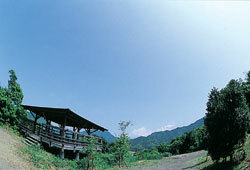 The rest area in Takimoto is an especially nice place to relax with your family. Copyright © 日高川町役場 All rights reserved.